Lovely one bedroom apartment, with sofa bed in living room / kitchen just off the bustling Grassmarket. Great views of the castle and within easy walking distance of the Royal Mile and Princes Street. A perfect location for visiting Edinburgh. Very close to all the major parts of Old town and a great spot to venture from. Good customer service, lots of information, the apartment contained everything that was needed, it was clean and tidy with a beautiful view and a good location. Would like to come again. Edinburgh is a very nice city, big enough for opportunities and small enough for convenience. Many nice restaurants and pubs! Great location, very comfortable apartment. Would definitely stay there again when coming back to Edinburgh. This is a comfortable and cosy little apartment. Well located for the Grassmarket area and within easy walking distance of the Royal Mile and Princes Street and all they have to offer. The apartment has a good view of the castle and is bright with 3 windows in the living room/kitchen area. The kitchen area is compact and well equipped. We liked the fact that the apartment had key code controlled entry and it was very quiet. We hope the new building, currently being constructed directly adjacent to the apartment building, does not spoil the view but even so would certainly return as this is an excellent base in the city just for 2. We appreciated the milk, fruit and biscuits left for us on arrival and the fresh flowers, thank you. Location was great and was overlooking the castle. Everywhere was walkable but bus stops nearby if needed. The apartment was modern and clean and had all the amenities required for a comfortable stay. The kitchen was well stocked with pots and pans, even a washing machine and dishwasher. There were provisions which we weren't expecting like milk, tea, coffee, sugar, oil, washing up liquid and toiletries. The host was lovely and met us at the apartment. Great location and excellent service by Katie who received us. Great location near a grocery with a view on the Edinburgh Castle. The lady who received us, Katie, was helpful and gentle. Only one problem: not enough place to hang up the towels in the bathroom. We had a nice stay. This is a very good location for exploring Edinburgh. Note that there is no elevator. We had a child and therefore a stroller with us. So we had to carry it up and down the stairs. But for us that was not a big problem. Location difficile à trouver si vous venez de l'aéroport avec le Air Link 100. Descendre à West end et prendre un taxi c'est encore le plus simple. Arrivée de l'avion 17h30 pour un RV à 19h c'est trop juste...et Katie est très pressée.... ce qui laisse peu de temps pour les explications de base si on ne maîtrise pas bien la langue anglaise.... D'ailleurs cette location est essentiellement prisée des anglo-saxons. Appartement bien situé pour visiter la ville qui est splendide. Un livre d'histoire à ciel ouvert. Le château d'Edinbourg mérite une demie journée de visite, les 2 musées gratuits (national galery et art moderne) sont riches. Holyroodhouse (résidence de la Queen Elizabeth) est décevante sauf la partie consacrée à Marie Stuart. Ne pas prendre un billet complet, seule la visite du château est intéressante. The flat was in excellent condition and comfortable, really close to all tourists spots in Edinburgh and bars. Definitely would recommend! The Grassmarket apartment is in located equi-distance between the Scottish National Galleries of Art and the Scottish National Galleries of Modern Art, about a 25 minute walk to each. There are a number of excellent secondhand book shops and vintage clothing stores in the area, a Sainsbury's and a number of standard pubs within 3 minutes walking distance. The apartment itself looks like the pictures. It isn't flash but has everything you need and is comfortable and clean. The host met me to check-in and was very helpful, giving me eating recommendations and pointing out highlights on a map of the city. Good base for a break in Edinburgh. Most of the cities attractions and bars and restaurants well within walking distance. Beautiful apartment in a great location. Thank you for the kind hospitality and service. Would def stay again! Lovely appartment, excellent location, good communication. We had a lovely time in Katie's appartment! It's located right in the center, just a few steps from the 'action'. The place itself is not too big but had everything we needed (kitchen with appliances, nice dining/sitting area, separate bedroom and bathroom). We loved the nice bed and our baby loved the bath tub. Katie was great in providing us with all the info we needed to reach the place and was very clear and quick in her communications. Katie, thanks for a great stay! A lovely light, quiet apartment with stunning views and thoughtful touches like fresh flowers and real coffee. The pictures were a good description. Central and easy to find. This apartment perfectly suited my needs. It was close to Grassmarket and the Royal Mile, but without the attendant noise. The apartment was clean and comfortable. It is suitable for one or two people who spend most of their day seeing the sights and need a place to rest and sleep. When I return to Edinburgh, I would definitely stay here again. Katie was most helpful and granted valuable information in her welcome letter. She met us With flower upon Our arrival late in the evening and was sure that everything was ok and comfortable. The Apartment is small but conveniently furnished and the location is good for sightseeing by foot. A bit noisy during nighttime from festivities outside the apartmenthouse if you leave Your window open. The Apartment is well equipped and has a wonderful bathtub. Very clean and cozy inside. The apartment is in a very central location in the shadow of the Castle. It is a perfect base from which to explore the town. It was very clean and welcoming with the essentials for tea and coffee provided along with lovely flowers. Highly recommended. We spent some extra days after a conference with my friend in this very Scottish style flat. Everything was real close: shops, restos, whiskey bars :) The best part of this flat is Katie, a charmant lady with big hart. She made all her best that we feel good. Beautiful space, very comfortable, wonderful welcome and resource sharing from Katie. Perfect stay!! Excellent! Met and exceeded our expectations. Many thanks! Especially liked the location and gorgeous view of the castle! Many thanks to Katie for her warm and helpful welcome and great resources (maps and info. Etc). We shall return! This flat felt very cramped, and lacked space for maneuvering or storage. There is one tiny dresser in the bedroom, and one in the hallway that is already full of bedding & towels. The closet storage was also already full with extra bedding. (there was room for hanging, though) Cramming 2 couches in the very small living area seems unnecessary, when the flat is so small already. The shower was terrible, with the shower curtain wrapping around you as you showered, while leaning against the wall to avoid it. It had a great view of the back side of the castle, along with the abandoned buildings below it. It was wonderful to have a parking space, but the building felt like we were staying in "the project". There is a clothes washer, that has a drying function, but we learned the hard way that the drying function is not set up to function here. We spent our last night in Edinburgh with hair dryers, trying to dry our clothes before packing. Not the best ending for our trip. Our host was very nice, and had some great suggestions for the city, and was very helpful overall. Dear Jon, Thank you for praising your host and the views from the apartment. We are sorry to hear that you don’t feel you had the same great experience in the apartment reported by our other guests. While the apartment is compact, we believe this is part of its charm and we or our other guests do not consider it “somewhat drab”. It is our intention that the dresser in the hallway does offer storage space, in addition to that of the closet you mention. The two couches in the sitting room allow for the capacity to entertain visitors and match the seating provision for four at the dining table but we will replace the smaller sofa with a single arm chair. While the drying function of the washing machine is not available, drying racks are in the apartment and faster drying can be achieved by hanging clothes in the warm boiler cupboard. This was a marvellous apartment right in the heart of Edinburgh with great access to all the attractions in the city centre. Greatbase could not have been more helpful and made our stay all the more enjoyable. Would recommend to have the check-in time to be earlier like 11am than 3/4pm it’s too late (only if you are not working). Had to carry my bags around the city and was not able to see most things. Part from that the apartment was in a good location and everything you wanted if you were staying at home. Sorry Bhavin, we can't do a check in time around 11am especially when there are guests leaving that morning. If you would like in the apartment in before 1pm you need to book the night before so that the apartment is clean and ready for you. There are places in the city centre were you can leave bags if you arrive early and we did send you these details before you arrived. You will not be disappointed with this Airbnb experience. Located about 150 steps from Grassmarket this apartment was clean, safe and with nice personal touches. Katie met us upon arrival and quickly made us feel at home and offered any assistance. 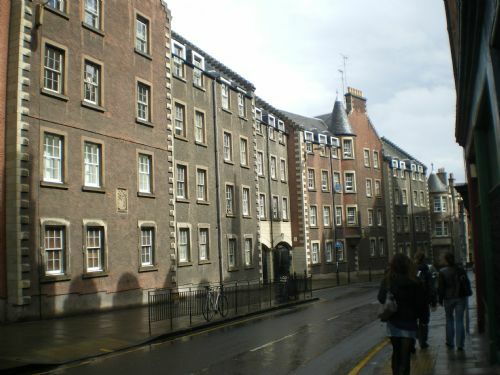 Also located within a short walk is the Royal Mile. It's a beautiful walk passing breakfast cafés, a fromagerie to die for, shops and pubs. The castle sits atop the cliff and can be seen right from your living room window. A grocery store is located one block away. As we were 2 girls travelling together, we felt very safe and would absolutely not hesitate to book here again! Thank you, Katie, for a great, great stay in Edinburgh!! Thank you Katie and Jack for making our stay memorable. The flat was really well presented and in a great location. The little touches of flowers and basic food needs was a real bonus as we arrived late. The honour system in replacing food as we used it works very well. The flat itself is in a great location and it had everything we needed for comfort. The kitchen and utensils were more than adequate and access to shops and transport ( and of course the castle) was great. That view from the lounge window is spectacular. We would highly recommend this flat for anyone staying in Edinburgh, whether you are getting on in age like us or you want the fun and hype of the Grassmarket area. You really don't need to bring anything along. It's all in the flat. Thanks again. We stayed in March 2016 for a long weekend to celebrate our anniversary. We wanted to be fairly centrally located and, when hotel prices proved to be silly expensive, we opted to find an apartment and liked the idea of being self-catering. Kate was quick to reply to all of my emails and very friendly and helpful. Grassmarket 1 was just as pictured and is in a superb location, just up the road from the main Grassmarket area but away from the busyness. It's in a horseshoe shape block of apartments, at one corner end that looks up to the back of the castle. The views were fabulous from the windows in the main area of the apartment! We were met by Jack who took us to the apartment and showed us everything, just after he left we realised the heating wasn't working as the control panel needed new batteries but after a phone call to Kate, she came round with new batteries and 10 minutes later it was sorted, no bother. The apartment itself had everything we needed, good kitchen area, great shower and very comfy bed. It was nice to see a welcome pack with fruit, biscuits and milk for us, and some daffodils! We brought tea and coffee with us, but there is a supermarket literally just up the road which was really useful. We brought an i-Pod docking station with us too to play music. The wi-fi was handy too. All in all, we had a superb long weekend stay which was made even better by the fact we were in an apartment and had our own space to come back to. It has definitely made us want to use more self catering apartments in the future instead of hotels and am sure we'll be staying with Great Base again on our next visit to Edinburgh. A lovely apartment in an excellent location with superb views of the castle. The apartment is well equipped and very comfortable. It is within walking distance of everything we wanted to see in Edinburgh and there were plenty of good pubs and restaurants nearby.The booking process was easy, we were met at the apartment by Jack as arranged who gave us lots of useful information about the local area. It was handy to have milk. tea, coffee, biscuits etc provided and the daffodils were a lovely touch! We would stay here again. Lovely cosy apartment. Probably best apartment we have stayed in when in Edinburgh. 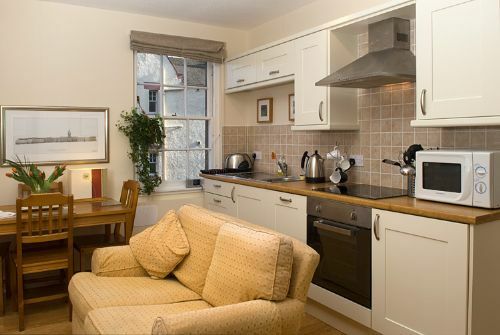 Within walking distance of royal mile, train station etc. Booking etc all really straightforward. Will definitely be back. Really close to local supermarket and restaurants. Excellent apartment in a great location. Few minutes walk from the grass market and ten minutes to princess street and Royal mile . The apartment Also had parking which was very handy . Friendly Welcome by great base and everything explained clearly with tea coffee milk biscuits and fruit provided which was a nice touch . Excellent location, close to Conference centre, next to Grassmarket & easily walkable to Royal Mile & Princess at. Very light apartment with views to back of castle. The apartment was exactly as described. We were meet at the front gate and felt very welcome. Our train was running late and there was no problem communicating this to Katie to change our arrival time. My 14 year old daughter and I had a great stay. The location was perfect for exploring Edinburgh and there was even a grocery store just a few minutes walk. The apartment was comfortable, well appointed, pretty and convenient. Fresh flowers, nice bedding and Katie's friendly welcome made our stay extra nice. Katie met us at the apartment even though we were 10 minutes late due to getting lost from the airport. There were beautiful fresh flowers that bloomed during the 6 days we stayed in the apartment. We were also left with some cookies, fresh fruit, and milk. We cooked every breakfast and every supper. The kitchen was very handy. A grocery store was within a block or two away. Very convenient. It was fun to look up at the Castle out the living room window. The apartment was also close to a bus stop, very handy especially if you purchase a two day transportation pass. The only suggestion I would make, would be to take the small love seat out of the apartment. the living room is somewhat cramped and would seem roomier with one less couch. It would be very crowded with more than two people. it was convenient to use the washer, too. It was nice to have extra towels to use also. A brilliant location and a wonderful view! The apartment is perfect if you are a couple or an adult and two kids. The location is brilliant as everything is just a stroll away. The view from the window .. You see the castle is just beautiful. Most importantly Katie is fantastic! She is responsive and made our stay perfect. Excellent well situated apartment. Within walking distance of Waverley Station. Great view of the castle, with everything you need for a trip to Edinburgh. We rented the flat on very short notice and were very well looked after in the process. The flat is absolutely conveniently located and we enjoyed our stay. The flat provide everything that is needed. Thank you, Katie, for being so helpful! loved the flat so much history right outside the window. loved Edinburgh. loved the people--so kind and friendly. My son and I stayed--me in the bedroom and him on the pull out sofa. It's better for a couple--because pulling out the pull out sofa does't leave much room if you need to do something in the kitchen. That said--I would stay there again in a minute. Great location. We walked everywhere. This was the perfect base for our weekend of Christmas shopping. The flat was spotless and had everything we needed. The only criticism is that the travel cot was a little lumpy, so that our son had to sleep round the edges rather than in the centre of the cot. Other than this small detail it was utter perfection and I would recommend it to anyone looking for somewhere to stay in Edinburgh. Grassmarket is in a great location - walking distance to many shops and restaurants in New and Old Towns and nearby. We had 3 full days in Edinburgh and walked everywhere. The apartment was very clean, bright, and comfortable with nice views of the back of the castle. Grassmarket is a very lively area on weekends and the apartment was fairly quiet at night. The double bed was very comfortable. Kitchen/living area was fully equipped - we made breakfast every morning. Nice bottle of wine and fresh flowers were nice additions. Shower had good pressure although a little tricky to get in and out of the shower as it was a bit elevated. More ventilation in the bathroom would be good, as well as more hooks to hang clothing and towels. Katie and Jack were great. Thank you for a memorable stay! We absolutely loved this apartment. The windows on 2 sides of the open concept living room/kitchen were wonderful. Provided lots of light and of course great views. Rooms were large, cosily furnished, and very, very clean. It was well equipped with everything we could possibly need. Pamphlets, tour books, restaurant guides, and location of local amenities all provided. Bedroom and bed were very comfortable. Bedding was great. silly I know but "adequate"hangers to hang our clothes. They gave good thought to this place as I am sure they did on their other locations as well. Good central location near all sites we wished to see. If we are ever in Edinburgh again we will certainly stay here and will recommend it to anyone who wishes to visit the city. Stayed here last week for my son's graduation. This is a lovely apartment with a great view of the castle. Location in Grassmarket is perfect and it has everything you need. Would definitely stay again. The owner was very nice and helpful too. The booking was handled efficiently and expertly. The location of the apt could not have been better. Views of the castle, especially at night, were great. Grassmarket restaurants and pubs right around the corner.The ling room area could be altered to maximize space better. The couches need replacement. Lots of windows to open for fresh air. Expect some road noise and late night yelling after the pubs close. Grocery right up the street. Great tub for soaking after a day of wee wandering. Safe. We would stay again without any hesitation! Gracias Katie por tu recibimiento y amabilidad. Han sido unos días estupendos en Edimburgo. Es impresionante la vista del castillo de Edimburgo desde el apartamento, superluminoso y alegre. Una cosa muy buena que tiene el apartamento es que estando en la Old Town está muy cerca de la New Town, es un verdadero placer pasear por las calles de la New Town, ver sus edificios de arquitectura georgiana ( siglo XVIII) sus, entrar en las galerías de arte y los pubs y los domingos por la mañana ir a Stockbridge, comer en el mercado y pasear por el río... Hemos vuelto enamorados de la New Town. Creo que el apartamento está en un sitio perfecto para disfruytar de la ciudad. Thanks a lot Katie for your kind welcome. We had a wonderful sta in Edinburgh! The apartment is bright and joyful and it has an amazing sights of the Castle. The apartment beeing in Old Town is so close to the New Town, and we really enjoied walking along the New Town's streets, looking at the georgian architecture of XVIII century, going to the art galleries and pubs (Hamilton's, Bon Vivant, The Anticuary...) and on Sunday morning having lunch in Stockbridge market and a walk along Water of Leith... We have came back to spain in love with Edinburgh and its New Town! The apartment is located in a perfect place to enjoy the city. Thank Katie! Apartment is located in the center of the most vively part of the town. Very cozy and comfortable, has everything that is reqiured for a pleasant stay. I thoroughly recommend this flat - beautiful view of the castle, very central, comfortable and clean. Also great to arrive somewhere with fresh flowers, a bowl of apples, and milk in the fridge for the first cup of tea! Lovely cosy flat in an excellent location, bar, shops, restaurants, supermarket and main tourist attractions were all in easy walking distance. Car parking space as a great bonus and the flat itself felt secure. It was clean and had everything we could want, including a great view of the castle. Would definitely recommend this apartment.